One of the two base Spy genres. 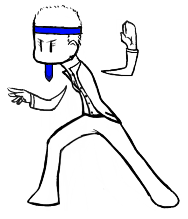 The Action Agent is characterized by increased acrobatics and combat skills. The Action Agent is the primary Action-based genre of the Spy. Of all the genres, it is probably easiest to generate Action with the Action Agent. The Action Agent also has the most versatile uses of Action points. Points of Action can be spent to do anything from dodging bullets to retroactively planting stickybombs on something you recently touched. The possibilities are truly endless, but if you want a few ideas you can check out some of nowucme's guides on proper Spy usage.